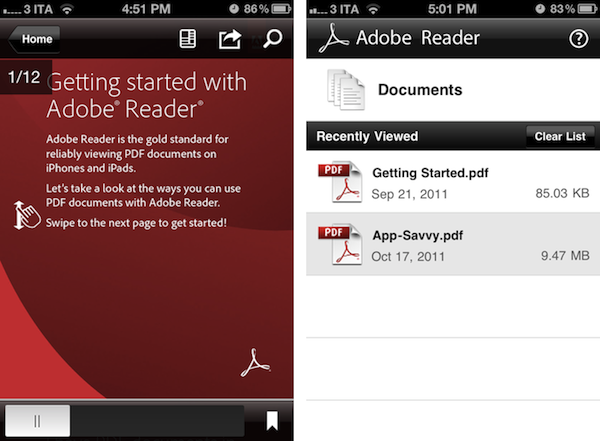 Adobe today released its popular Adobe Reader PDF reading application for iOS devices; the software, available for free on the App Store, runs natively on the iPhone and iPad as a universal app. Back in August, Adobe released CreatePDF for iOS, a utility to turn a variety of documents into Reader-compatible PDF files that preserved quality and accessibility standards with the inclusion of links, images, and footnotes. With the release of Adobe Reader today, Adobe is giving iOS users two tools to create and properly read PDF documents, respectively. Adobe says that Reader for iOS works with several PDF document types, including PDF Portfolios, password-protected PDF documents and Adobe LiveCycle rights-managed PDF files. Upon first launch, the app opens a document view with a Getting Started.pdf file ready to be viewed to get familiar with the app’s UI and controls. A scrubber bar along the bottom lets you quickly skim through pages, which can be displayed “continuously” in the reading view, or through a single-page visualization that will let you scroll horizontally between pages. You can pinch or double-tap to zoom, and rendering performances on zoomed documents seemed fairly decent on my iPhone 4. In PDF documents, text can be selected and copied to the clipboard, or you can search using the icon in the upper toolbar; a bookmarks icon in the bottom bar enables you to quickly navigate the sections of a document. One nice touch of Adobe Reader are “tap zones”, which in Single Page mode let you jump back and forward by tapping on the left and right edges of a document. PDF files can be emailed using Adobe Reader, opened with another app using the “Open In” menu, or printed through Apple’s AirPrint. According to Adobe, Reader for iOS is capable of viewing PDF Portfolios, PDF Packages, annotations and drawing markups as well as reading text annotations like sticky notes. In my tests, performances with a 350-page PDF document were similar to Apple’s iBooks, which can also preview PDFs. iBooks was slightly faster at page animations and rendering text while zooming on a document — the app has indeed been recently updated with bug fixes and performance improvements. If you need to preview specific PDF documents that might have some compatibility issues with iBooks, Adobe Reader on iOS might be a good choice.